With an eye to the future, Canadian under-20 soccer coach Rob Gale has called up 15-year old midfielder Alphonso Davies for an eight-day camp in England. Davies became the youngest signing in the United Soccer League's history when, aged 15 years three months and three weeks, he became a member of Vancouver Whitecaps FC 2 in February. Previously with the Edmonton Strikers, he joined the Whitecaps' under-16 residency program last summer. 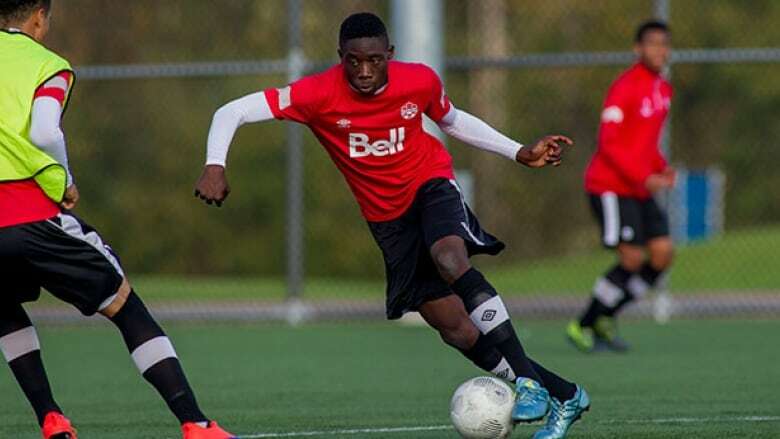 The Liberian-born midfielder has already been called up by the Canadian under-15 team. He was due to join an under-17 camp in February but was with the Whitecaps in training camp, seeing action in several MLS pre-season games. "That tells you how highly regarded he is by both club and country," said Gale. "This is an opportunity for us to bring him in and see where he's at, see how he fits in around some older players and against some very good opposition," he added. The Canadian team, which leaves Monday, will play England twice in Doncaster — on March 24 in a closed-door match and March 27 at Keepmoat Stadium. England has asked to use an under-21 squad against the Canadians. "We're going to give the players the opportunity to shine," Gale said. "Let's see what they can do in that environment." Canada last played England at the under-20 level in November 2014 in Bournemouth in a game that ended in a 2-2 draw. Toronto FC striker Jordan Hamilton, who scored the equalizer in that game, is back for this camp. Other returning players are Whitecaps goalkeeper Marco Carducci and midfielder Marco Bustos and FC Edmonton's Marko Aleksic. The English trip replaces a planned camp in Costa Rica and Panama that was cancelled due to concerns about the Zika virus. England had a cancellation, opening the door for Canada to come over. Players born 1997 or later are eligible for the current cycle of CONCACAF/FIFA competition leading to the FIFA U-20 World Cup Korea Republic 2017. But Gale has opted to blend in some young talent, including Davies and 16-year-old FC Montreal midfielder Ballou Tabla. Both are eligible for the 2019 FIFA U-20 World Cup. Gale was not able to get all his players. Injury has prevented St. Lucia-born midfielder Caniggia Elva, currently with VfB Stuttgart II in Germany, from making his youth team debut. Gale says while midfielders Josh Doughty (Manchester United) and Harry Paton (Fulham) are both still under consideration, he is looking at this time for players pushing for playing time in senior or under-21 football. Chelsea defender Fikayo Tomori is part of the squad. Goalkeepers: Marco Carducci, Vancouver Whitecaps; James Pantemis, FC Montreal. Defenders: Marko Aleksic, FC Edmonton; Liam Fraser, Toronto FC II; Thomas Meilleur Giguere, FC Montreal; Fikayo Tomori, Chelsea (England); Gabriel Boakye, unattached; Kadin Chung, Vancouver Whitecaps 2; Marcus Godinho, unattached. Midfielders: Tristan Borges, SC Heerenveen (Netherlands); Marco Bustos, Vancouver Whitecaps; Alphonso Davies, Vancouver Whitecaps 2; Marco-Leonel Dominguez, FC Montreal; Duwayne Ewart, Pittsburgh Riverhounds; Shamit Shome, FC Edmonton; Ballou Tabla, FC Montreal; Luca Uccello, Toronto FC II. Forwards: Jordan Hamilton, Toronto FC; Dario Zanatta, Hearts (Scotland).